A short saga at a mere 13 chapters, Gunnlaug Serpent-Tongue is intimately linked with the other major sagas: the woman in the love triangle at the heart of the saga is Helga, daughter of Thorstein who is the son of Egil Skallgrimsson, the hero of Egils saga; his sister, Thorgerd (Egil’s-daughter) married Olaf the Peacock and so is mother to the ill-fated Kjartan, key figure in the love-triangle at the heart of the Laxdaela saga. Njal’s saga and Eyrbyggja saga are also referred to. This along with the relative lack of crude violence and the focus on matters of the heart make it feel late – medieval not dark age. 1 – Thorstein, son of the hero and poet Egil Skallagrimsson (Egils saga), is married to Jofrid, daughter of Gunnar Hlifarson, the best fighter in Iceland: number two is Gunnar of Hlidarendi (hero of the first part of Njals saga), number three, Steinthor from Eyri (leader of the Thorlakssons and a central figure in Eyrbyggja saga). (Thorstein’s life is summarised in the final, ninetieth, chapter of Egil’s saga.) They live at Borg, Egil’s farm. 2 – A Norwegian ship puts into harbour and Thorstein puts up the skipper. One day they go to rebuild one his farm buildings. Thorstein dozes and when he wakes tells the Norwegian his dream: a beautiful swan is on his roof. Two eagles fly down and fight over her, both fall dead. Then a hawk flies down, chats to her, and they fly off together. The Norwegian interprets: Thorstein will have a baby girl. Two heroes will fight over her and die. A third will take her. Thorstein angrily dismisses the interpretation. 3 – Jofrid is pregnant. Thorstein is heading off for the Althing and tells her, if it’s a girl, leave it out exposed to die. In his absence Jofrid has the girl (984) but secretly sends her to her sister-in-law (Thorstein’s sister) Thorgerd, at Olaf the Peacock’s home, Hjardarholt. There she is raised for 6 years until Thorstein happens to pay a visit to Hjardarholt and remarks on the beauty of this little girl. Thorgerd tells her the truth. Thorstein thanks her and takes little Helga the Fair home to Borg. 4 – Introducing Illugi the Black (who features in chapter 17 of Eyrbyggja saga). His son is Gunnlaug (b.984) big, strong, impetous, a good if abusive poet, not unlike his grandfather the great Egil. When he was 12 he asked his dad if he could have wares to travel abroad. His dad refuses then find Gunnlaug emptying the stores and readying a horse to go anyway. Illugi refuses and puts everything away, and Gunnlaug goes to Bord, to Thorstein, to take refuge. Thorstein puts him up for years. He gets close to Helga the Fair with her lovely long golden hair. Thorstein teaches the boy law. One day he asks Thorstein to teach him how to betroth himself to a woman and asks, jokingly, to be shown what form of words he must use to Thorstein to ask for Helga’s hand. And he says the words and everyone thinks it’s a game. 5 – Introducing Onund who lives south at Mosfell. Three sons, eldest Hrafn. About this time Iceland is converted to Christianity (1000). By now Gunnlaug is 18 (1002). He asks Illugi again if he may go abroad and this time Illugi buys him a part share in a boat (owned, as it happens, by Audun who is mentioned in Laxdæla saga for refusing to help the sons of Osvif escape after they’ve killed Kjartan Olafsson). Before he sails Gunnlaug pesters Illugi about marrying Helga. Illugi is worried he is too flighty and changeable. Gunnlaug brings Thorstein to meet Illugi and the two almost argue until Illugi concedes Helga will wait three years while Gunnlaug is abroad, but only provisionally; if Illugi doesn’t like him when he returns the deal is off. (It was just such a three-year promise which doesn’t work out for Kjartan and Gudrun in Laxdæla saga.) Gunnlaug sails for Norway in Audun’s ship. 6 – They land and go to the court of Earl Eirik Hakonsson (governor of Norway under Sweyn Forkbeard from 1000 to 1012). Eirik notices his foot is injured. Gunnlaug says you shouldn’t limp unless your legs are actually uneven lengths. A court follower named Thorir says he’s cocky. 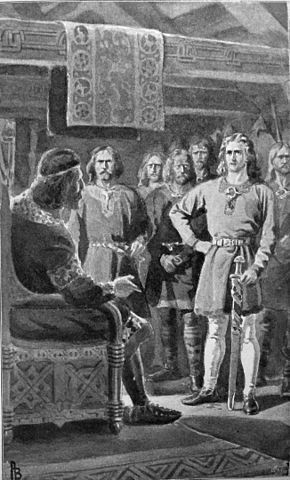 Gunnlaug speaks a verse threatening him. The Earl says he’ll not last another 18 years with htis attitude at which Gunnlaug says he’d better watch out, under his breath. Why? asks the Earl. Otherwise he’ll end up like his father Hakon the Good, murdered by a servant while hiding in a pigsty (!). Outraged the Earl orders Gunnlaug arrested but Icelander Skuli Thorsteinsson pleads on his behalf and gets Gunnlaug time to go down to the docks and board a ship for London. 7 – Dock in London then present themselves to the King Ethelred, son of Edgar, to his approval. Walking down the street Gunnlaug encounters berserk/thug Thororm and gives him money. Ethelred says it’ll be hard to get back and suggests a strategem. When he next meets him Thororm suggests a duel. Using the king’s trick Gunnlaug kills him and the king is grateful. Gives his permission for Gunnlaug to sail away, as long as he promises to return (medieval kings very clingy). 8 – Gunnlaug sails to Dublin and presents himself to King Sigtrygg Silk-beard who he charms with another poem. The king rewards him with fine clothes then Gunnlaug is off north to the Orkney Islands ruled by Earl Sigurd Hlodvesson. Again Gunnlaug recites a poem and is rewarded with a fine axe. He then sails east to Norway and stays in Vastergotland with elderly Earl Sigurd. Gunnlaug recites a poem he’s composed specially and is rewarded. Norwegians come south for Sigurd’s Yule Feast at which the guests start debating who is the better ruler, Eirik or Sigurd. Gunnlaug recites a poem which praises them both. When the Norwegians report this back to Eirik he is mollified and says Gunnlaug will be welcomed if he returns. 11 – Helga is not happy at the wedding. Hrafn takes her to his family home at Mosfell. Soon after she learns that Gunnlaug is back and is furious. She refuses conjugal relations with Hrafn and insists on moving back to her father’s house at Borg. Both families are invited to the wedding of Svertig and Hungerd and are seated next each other. Gunnlaug recites poetry to Helga and gives her the cloak Ethelred gave him. After the feast Gunnlaug jumps on a stallion and nearly rides Hrafn down, reciting complicated skaldic poetry. Helga never sleeps with Hrafn again. At that summer’s Althing Gunnlaug challenges Hrafn to a duel (1006). Hrafn gets first blow since he has been challenged. He makes a mighty swing at Gunnlaug’s shield, his sword breaks, and the fragment flying up cuts Gunnlaug’s face. At that both families intervene to stop the fight. The next day the Althing bans duelling so this was the last duel in Iceland. Next day, at the river Gunnlaug sees Helga again and she looks at him lovingly. Gunnlaug rides home to Gilsbakki where, one morning, Hrafn and 12 men stride into the hall. Gunlaug leaps to his feet but Hrafn has come to challenge him to a duel in Norway, far from their meddling families. 12 – (1007-8) Hrafn sails to Trondheim, waits all winter, then all summer, then another winter. Gunnlaug leaves late in the season and makes landfal on the Orkneys. Gunnlaug goes a-viking with Earl Sigurd. After proving a real hero, Gunnlaug departs for Norway where he is welcomed by King Eirik but forbidden to fight this duel (1008). So (1009) Gunnlaug sets off east in pursuit of Hrafn for several days into Sweden. Finally at a promontory between lakes called Dingenes they meet. They agree their handful of followers will fight too. Gunnlaug kills Hrafn’s two kinsmen Olaf and Grim. Hrafn kills Thorkel the Black. Then Gunnlaug hacks off Hrafn’s leg. He takes Hrafn water in his helmet but Hrafn treacherously hacks at his head giving him a bad wound whereupon Gunnlaug kills him. The Earl’s guides who brought him here bind Gunnlaug’s wound. Gunnlaug is brought into Levanger where he dies. 13 – Illugi has a dream seeing his son all bloody. So does Onund. At the Althing Onund refuses to pay compensation. In the autumn Illugi rode with thirty men to Mosfell. Onund and his sons seek sancgtuary in the church but Illugi kills two of his kinsmen. Hermund, Gunnlaug’s brother, broods on revenge. There is a rich merchant, a nephew of Onund’s also called Hrafn. One day Hermund rides over the moors and down the seashore and stabs him to death and rides off. The feud is declared over. Helga marries Thorkell Hallkelsson. They have many children but Helga never forgets Gunnlaug. An illness afflicts the household. Helga asks for the cloak Gunnlaug gave her to be brought out. She spreads it out in front of her and falls back in her husband’s arms dead.